Ki=12mv2Here, m is the mass of the ball. 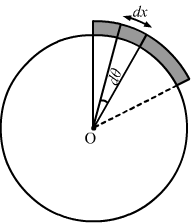 (d) the speed does not depend on the initial direction. As the stone falls under the gravitational force, which is a conservative force, the total energy of the stone remains the same at every point during its motion. ⇒12mv2+mgh=12m(vmax)2⇒vmax=v2+2ghFrom the above expression, we can say that the maximum speed with which stone hits the ground does not depend on the initial direction. 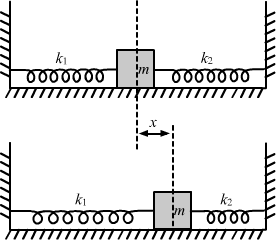 Let xA and xB be the extensions produced in springs A and B, respectively. -14kx2The work done by the spring on both the masses is equal to the negative of the increase in the elastic potential energy of the spring. 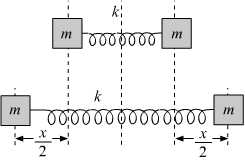 3glSuppose that one end of an extensible string is attached to a mass m, while the other end is fixed. The mass moves with a velocity v in a vertical circle of radius R. At some instant, the string makes an angle θ with the vertical as shown in the figure. ⇒12mv2+mgh=12m(vmax)2⇒vmax=v2+2ghFrom the above expression, we can say that the maximum speed with which the stone hits the ground depends on the speed of projection and greater than it. (d) it moves in a circular path. °. So, kinetic energy of the particle will remain constant. The force acting perpendicular to the velocity of the particle provides centripetal acceleration that causes the particle to move in a circular path. Consider two observers moving with respect to each other at a speed v along a straight line. They observe a bock of mass m moving a distance l on a rough surface. The following quantities will be same as observed by the two observers. (d) acceleration of the block. Acceleration of the block will be the same to both the observers. 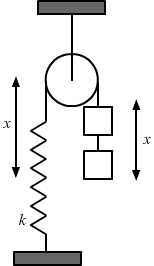 The respective kinetic energies of the observers are different, because the block appears to be moving with different velocities to both the observers. Work done by the friction and the total work done on the block are also different to the observers. Work done by us on the suitcase is equal to the change in potential energy of the suitcase. Here, mg is the weight of the suitcase and h is height of the table. Hence, work done by the conservative (gravitational) force does not depend on the path. (d) the object moves in such a way that the point of application of the force remains fixed. No work is done by a force on an object if the force is always perpendicular to its velocity. Acceleration does not always provide the direction of motion, so we cannot say that no work is done by a force on an object if it is always perpendicular to the acceleration. Work done is zero when the displacement is zero. °, so work done by the force on an object is zero. 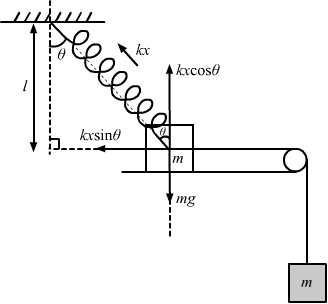 A particle of mass m is attached to a light string of length l, the other end of which is fixed. Initially the string is kept horizontal and the particle is given an upward velocity v. The particle is just able to complete a circle. 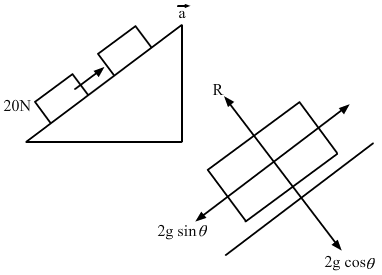 (a) The string becomes slack when the particle reaches its highest point. (b) The velocity of the particle become zero at the highest point. 12mv2=mgl(d) The particle again passes through the initial position. 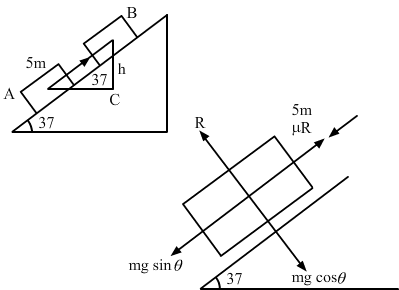 (d) The particle again passes through the initial position. The string becomes slack when the particle reaches its highest point. This is because at the highest point, the tension in the string is minimum. At this point, potential energy of the particle is maximum, while its kinetic energy is minimum. From the law of conservation of energy, we can see that the particle again passes through the initial position where its potential energy is minimum and its kinetic energy is maximum. F=mgWork done by the force of gravity depends only on the height of the object, not on the path length covered by the object. →r2= 3 m →i+2 m →jacts on it. Find the work done by the force on the particle during the displacement. F=α+bxacts on a particle in the x-direction, where a and b are constants. Find the work done by this force during a displacement from x = 0 to x = d.
Given that force is a function of displacement, i.e. Given: m=250 g, θ=37°, d=1 mHere, R is the normal reaction of the block. F2 m+Min the system, and the two blocks always move together. (a) Find the coefficient of kinetic friction between the bigger block and the horizontal surface. (b) Find the frictional force acting on the smaller block. (c) Find the work done by the force of friction on the smaller block by the bigger block during a displacement d of the system. Given: Mass of the block, m=250 gm=0.250 kgInitial speed of the block, u=40 cm/s=0.4 m/sFinal speed of the block, ν=0 Coefficient of friction, μ=0.1Force in the forward direction is equal to the friction force. 1·8×105 kgof water falls per hour and half the gravitational potential energy can be converted into electrical energy, how many 100 W lamps can be lit with the generated energy? Let the projectile hit the ground with velocity ‘v‘. mgh+12mu2=12mv2⇒10 × 40 + 12× 2500=12v2⇒v2=3300⇒ v=57.4 m/s=58 m/sThe projectile hits the ground with a speed of 58 m/s. The 200 m free-style women’s swimming gold medal at Seoul Olympics in 1988 was won by Heike Friendrich of East Germany when she set a new Olympic record of 1 minute and 57⋅56 seconds. Assume that she covered most of the distance with a uniform speed and had to exert 460 W to maintain her speed. Calculate the average force of resistance offered by the water. Time taken to cover 200 m, t=1 min 57.56 seconds=117.56 sPower exerted by her, P=460 WP=WtWork done, W=Pt=460×117.56 JAgain, W=Fs⇒F=Ws=460×117.56200=270.3 N≈270 N∴ Resistance force offered by the water during the swim is 270 N.
F=ma=95×103=9503 NMax speed, ν=pF⇒v=3.5×746×3950 ⇒8.2 m/sAs the scooter can reach a maximum of 8.2 m/s while producing a force of 950/3 N, the specifications given are not correct. Given,Mass of the block, m=30 kgSpeed acquired by the block, ν=40 cm/s =0.4 m/sDistance covered by the block, s=2 mLet a be the acceleration of the block in the downward direction. 12×4×0.36+12×1×0.09 [As, R=4g=40 N]=-μ 40×2+1×40×1⇒ 0.72+0.045=-80 μ+10⇒μ=9.23580=0.12So, the coefficient of kinetic friction between the block and the table is 0.12 . =12mν2+mgh-0⇒W=12×0.1×25+0.1×10×0.2As, h=2r=0.2 mW=1.25+0.2=1.45 JSo, the work done by the tube on the body is 1.45 joule. Given,Mass of the car, m=1400 kgh=10 mSince the car is moving when the motor stops, it has kinetic energy. Thusvi=54 km/h×518=15 m/svf=0△K=12mvf2-12mvi2△K=12×140002-152△K=-157500 JLet the gravitational potential energy be zero at the starting point.Then the potential energy at the terminal isUi=0Uf=mghUf=1400×9.8×10=137200 J△U=Uf-Ui△U=137200-0=137200 JLet W be the work done against friction during ascent.Then “-W” is the work done by the frictional force.-W=△K+△U-W=-157500+137200-W=-20300 JW=20300 JSo, work done against friction is 20,300 joule. νbe the final velocity of the block when it reaches the ground by sliding. In a children’s park, there is a slide which has a total length of 10 m and a height of 8⋅0 m (figure 8-E3). A vertical ladder is provided to reach the top. A boy weighing 200 N climbs up the ladder to the top of the slide and slides down to the ground. The average friction offered by the slide is three tenth of his weight. Find (a) the work done by the ladder on the boy as he goes up; (b) the work done by the slide on the boy as he comes down. Neglect any work done by forces inside the body of the boy. F=200×310=60 N(a) Work done by the ladder on the boy is zero, as work is done by the boy himself while going up. θ=0y=-0.5Using equation of motion along the horozontal direction, -0.5 = u sin θ t – 12 gt2⇒0.5=4.9×t2⇒t=0.31 secSo, x=ν cos θ t =3.1 × 0.31=1 mSo, the particle will hit the ground at a horizontal distance of 1 m from the other end of the track. F=μR=μmg=10×1=10 JSo, the K.E. is used to overcome friction. ⇒S=WF=10 2 =5 mThe block stops after covering 5 m on the rough surface. Let ‘dx‘ be the length of an element at distance x from the table. μ. Find the work done by friction during the period the chain slips off the table. Consider a small element of length ‘dx’ and mass ‘dm‘ on the table. Given,Mass of the block, m=250 g=0.25 kg, Spring constant, k=100 N/mCompression in the string, x=10 cm=0.1 m,Acceleration due to gravity, g=10 m/s2Let the block rises to height h.
12kx2=mgh⇒h=12kx2mg=100×0.012× 0.250×10=0.2 m=20 cmSo, the block rises to 20 cm. 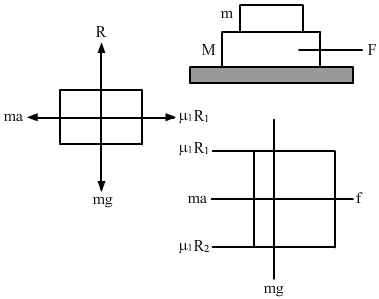 νcompresses a spring through a distance x before its speed is halved. Find the spring constant of the spring. ν→when it comes back to the original position shown? 12kx2 12mν2=12kx2⇒ x2=mν2kx=νmk(b) No. The velocity of the block will not be same when it comes back to the original position. It will be in the opposite direction and the magnitude will be the same if we neglect all losses due friction and spring to be perfectly elastic. Given: Mass of the block, m=100 g=0.1 kgCompression in the spring, x=5 cm=0.05 mSpring constant, k=100 N/mLet v be the velocity of the block when it leaves the spring. ⇒ t=0.63 sec,So, x=u cos θ t=1.58×0.36=1 mTherefore, the block hits the ground at 1 m from the free end of the spring in the horizontal direction. mgl+12mv2=mg(2l)+0⇒v=2glLet the rod be released from a height h.
10 gl, where l is the length of the pendulum. Find the tension in the string when (a) the string is horizontal, (b) the bob is at its highest point and (c) the string makes an angle of 60° with the upward vertical. 3 gl. Find the angle rotated by the string before it becomes slack. 57 m/s. (a) Find the angle made by the string with the upward vertical when it becomes slack. (b) Find the speed of the particle at this instant. (c) Find the maximum height reached by the particle over the point of suspension. Take g = 10 m/s2. ν=57-3g 1+cos θ =9=3 m/s(c) As the string becomes slack at point P, the particle will start executing a projectile motion. i.e. K.E.A+P.E.A=K.E.B+P.E.B⇒ P.E.A=P.E.Bbecause K.E.A=K.E.B=0So, the maximum height reached by the bob is equal to the initial height of the bob. =90° and x=L2,Let the string become slack at point C, so the particle will start making a projectile motion. νwhen the body leaves the surface. vto be half the minimum calculated in part, (b) find the angle made by the radius through the particle with the vertical when it leaves the sphere. N=mg-mv2R(b) When the particle is given maximum velocity, so that the centrifugal force balances the weight, the particle does not slip on the sphere. 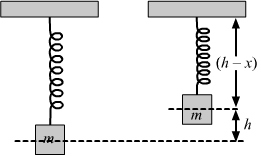 ν2when it loses contact with the surface, as shown below. ν0, where will the block lose contact with the track? N=V2R=6 mg lR sin θ + 1-cos θ(c) Let the loose contact after making an angle θ.
dνdtof the chain when the chain starts sliding down. Let us consider a small element, which makes angle ‘dθ’ at the centre.